Sapphire Gemstone Necklace - I recently came to the realization that it is time to "use up the good stuff" - and I have several listings now that contain the most beautiful gems in my stash. How many of you have heirloom china or silver in your cabinets that only grace your dining room table on "special" holidays? Life is too short for that! First, I purchased a lot of Rose Cut / Faceted Sapphires. I had 3 left from this lot and could not decide what to do with them. Then...I found the most colorful 8mm round Sapphire beads - and I just had to have them! The deep Eggplant-colored cabochon is set in sterling silver. I roll printed a pretty pattern on the back plate, and then fashioned a tiny rose from sterling silver to rest at the top of the pendant. The sapphire beads are interspersed with sterling silver rounds. I then added a two 5" lengths of handmade sterling silver chain, forged from 16 gauge silver. Each link is soldered closed, forged into an oval. and just a bit of texture has been added for a more rustic appearance on the silver. 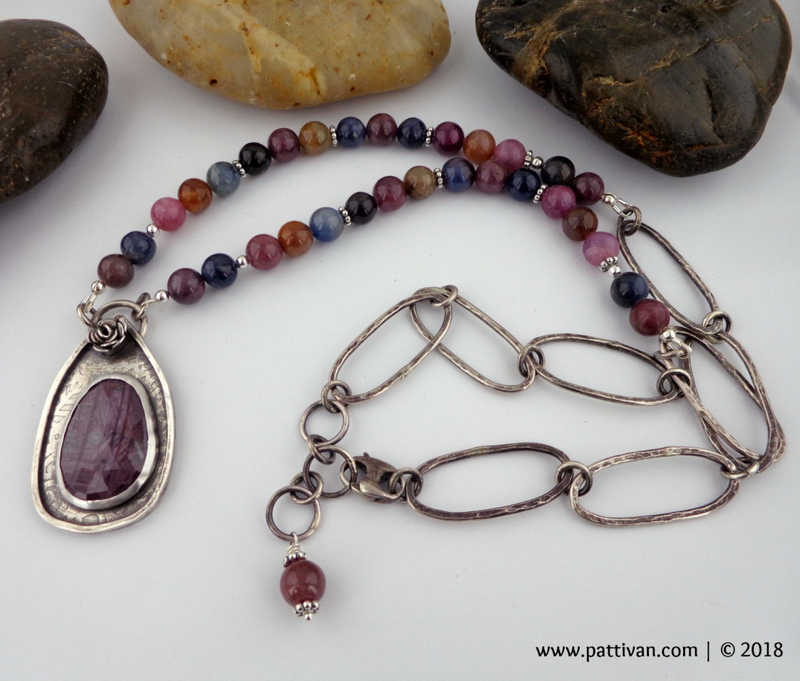 All metals used in this necklace are .925 sterling silver, which has been slightly darkened, buffed by hand, and tumbled to achieve a beautiful rustic patina. The necklace fastens securely with a sterling silver lobster clasp. Measurements: Overall length: 25 inches, including a 1 1/2" extender chain; Total Pendant Drop Length: just under 2". This is such a beautiful Statement Necklace meant to be worn for years to come! The multitude of colors in the sapphires allows it to be worn with just about anything! Jewelry is made using traditional metalworking techniques, including soldering, filing, sanding, texturing, polishing, and tumbling in my home studio. Jewelry comes wrapped in a cotton-lined gift box and ships quickly. Please feel free to contact me with any questions. NOTE: 100% of the proceeds from the sale of this necklace will be donated to Miracle Horse Rescue, a 501(c)3 Non-Profit Organization. From the bottom of my heart, thank you for helping me help those who cannot help themselves!